Power Inn is a 42 acre abandoned gravel quarry in Sacramento lying 30'-50' below the existing grade and bounded by a light rail line and two arterial roadways. The light rail stations give the unique opportunity to develop a mixed-use, pedestrian- oriented environment. The guiding design principles are to provide clear visual and physical connections and to provide social settings that accommodate community interaction. This is achieved by using four design elements: a coherent street pattern; an open space network; a community center; and architecture that addresses the street. Housing types that vary in scale and density enable a diverse mixture of households. 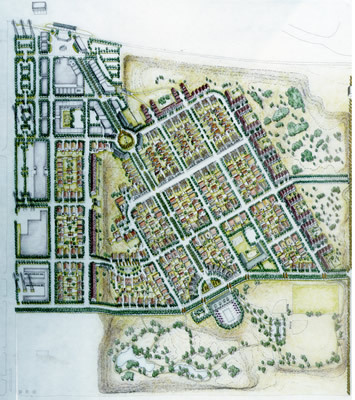 The project was undertaken to assess the feasibility of developing a “transit village” and included development of a land use plan; street layout and design; phasing and residential and retail architecture.